FORT HOOD, Texas — Carl R. Darnall Army Medical Center celebrated the heartbeat of patient care last week during National Nurses Week when it honored its civilian and military nurses during ceremonies held May 12 at the Fort Hood hospital. Capturing Advanced Practice Registered Nurse of the Year honors were Lt. Col. Kelley Togiola and Dr. Sheyanne Chan. CRDAMC’s Registered Nurses of the Year honors went to Capt. Teresa Rios-Rodriguez and Sheilah Priori. Spc. Stephanie Royse and Kenyetta Reeves were named CRDAMC’s Licensed Vocation Nurses of the Year with Joseph Ashford earning the honor of Certified Nursing Assistant of the Year. CRDAMC’s Military RN of the Year, Captain Rios-Rodriguez, said she was honored to be nominated by her peers and other staff members to earn the Military RN of the Year honors. Her 2005 deployment to Iraq was the impetus that led her to follow her heart into nursing. Nationally, the nursing profession is the largest healthcare occupation in the United States. Within the CRDAMC footprint, there are there are more than 850 nursing professionals ranging from registered nurses and licensed practical nurses to nurse practitioners and licensed vocational nurses. And it’s that relationship, said Col. David R. Gibson, CRDAMC commander, that’s key to compassionate care. For Lori Gardiner, a nurse practitioner in CRDAMC’s general surgery department, CRDAMC’s celebration of nurses was the first she has experienced in a military setting. Besides the award ceremony, CRDAMC nurses celebrated the week with various activities, including a breakfast, yoga and Zumba demonstrations, an ice cream social, poster board roundup, a women’s health lecture, scavenger hunt and a step competition. Capturing Carl R. Darnall Army Medical Center’s nurses of the year honors for the military Advanced Practice Registered Nurse of the Year was Lt. Col. Kelley Togiola with Capt. Teresa Rios-Rodriguez earning military Registered Nurse of the Year honors. The two awardees along with other nurse of the year winners were recognized during an award’s ceremony, held May 11. The ceremony was held in conjunction with National Nurses Week, an annual celebration that begins May 6 and ends May 12 on the birthday of Florence Nightingale, the founder of modern nursing. 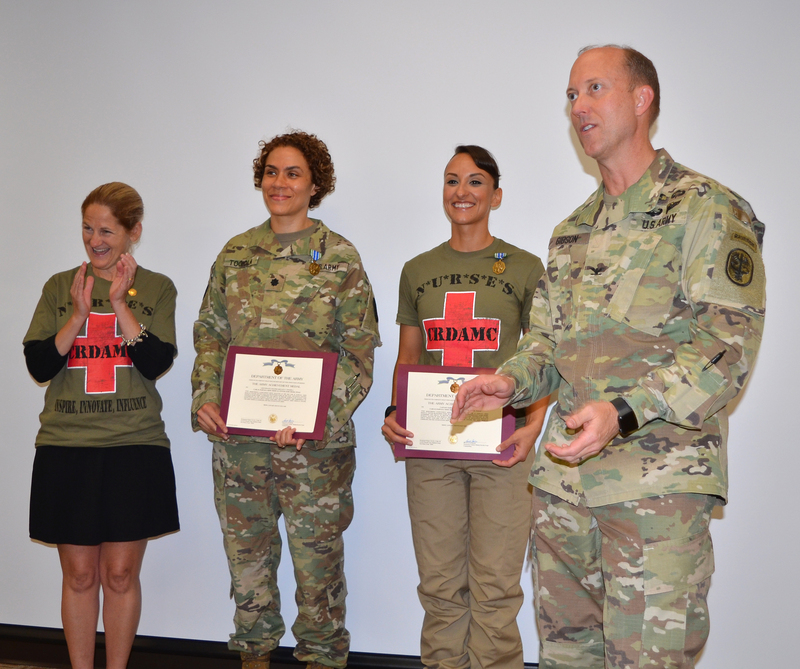 This year’s theme was “Inspire, Innovate and Influence.” From left, Col. Jennifer Robison, CRDAMC’s chief of nursing, Togiola, Rios-Rodriguez, and Col. David R. Gibson, CRDAMC commander.